"Shilow," a two-year-old German shepherd, was last seen round 9 a.m. in her owner's front yard on Tuttle Hill Road near Willow Road. Feb. 26, 2010 · 6:04 p.m. The Washtenaw County Sheriff's Office is investigating the larceny of a female German shepherd from a home in Augusta Township this morning. Deputies were dispatched to the area of Tuttle Hill Road near Willow Road at approximately 11 a.m. 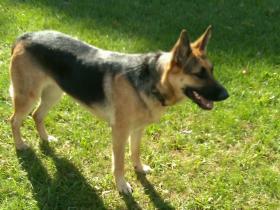 The two-year-old K-9, named "Shilow," was last seen around 9 a.m. in her owner's front yard. The possible suspect vehicle is described as a small early '90s sedan, dark blue or black two-door in color. The vehicle was occupied by two white males in their mid 20s. If you have any information reference to her where abouts please contact the WCSO confidential Tip line at # (734) 973-7711 or Crime Stoppers at #1-800-SPEAK UP.